Since Wikipad partnered with Gaikai to have them on their Wikipad Android gaming tablet and OnLive functionality was also hinted at by Wikipad, a lot has happened. Gaikai was purchased by Sony for $380 million, and OnLive went through ABC bankruptcy and started their reorganization. Now Wikipad President of Sales Fraser Townley in a talk with Joystiq confirmed that both OnLive and Gaikai applications will appear on the Wikipad by simply saying "yes." Speaking about OnLive he said that he didn't have much knowledge what was happening at the company, but promised that "if the service is still running when we launch Wikipad, it'll be there." Of course, since the NVIDIA Tegra 3 powered Wikipad is an Android mobile gaming device and will surely have access to Google Play, OnLive will work on the device from the get-go as they are available on the Google Play marketplace and already work on nearly any Android tablet. In the past, OnLive has also shown a lot of flexibility and fast responses to adapt their controls support for various mobile devices like the built-in slide out gamepad on the Sony Xperia PLAY and the PS3 controller support on the Sony Tablet S.
It's not yet clear if the OnLive App for Android will work with the Wikipad gamepad controller dock with no modification, if Wikipad can make it work, or if involvement from OnLive is required to update the OnLive App for Android and make it work with the Wikipad gamepad controller dock. 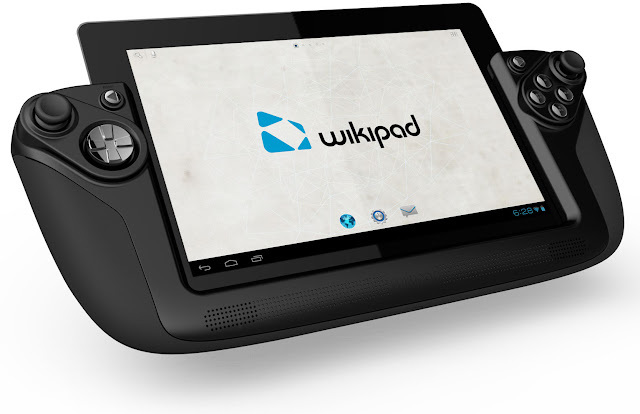 The Wikipad is already up for pre-order at GameStop where it will be sold at retail and online. All other major retailers will be taking orders for the Wikipad online. The Wikipad is priced at a premium tablet price of $499.99, which includes the Wikipad gamepad controller dock and 16GB of memory.